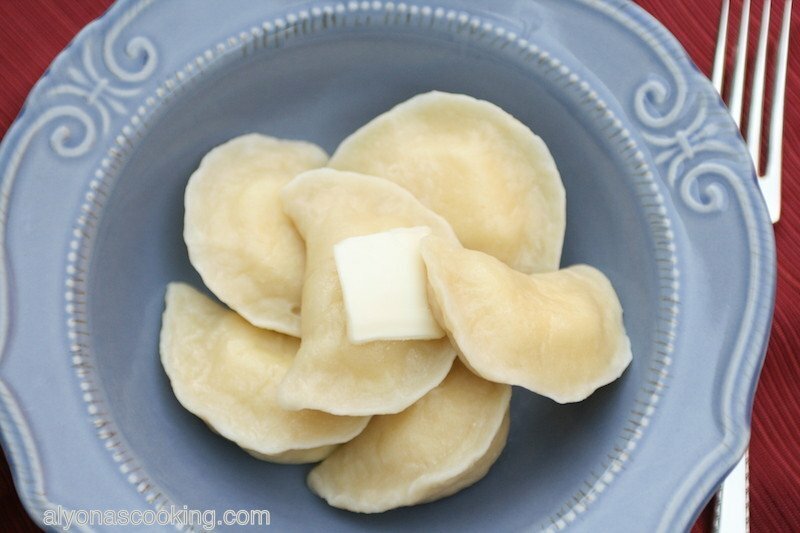 Vareniki are classic Slavic dumplings that are usually filled with farmers cheese, berries, mashed potatoes and many other meatless variations. They are then shaped into half moon shapes and usually boiled until al dente. 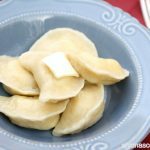 Vareniki are typically made from a yeast free kind of dough and this recipe will show you both mixer and bread machine version. 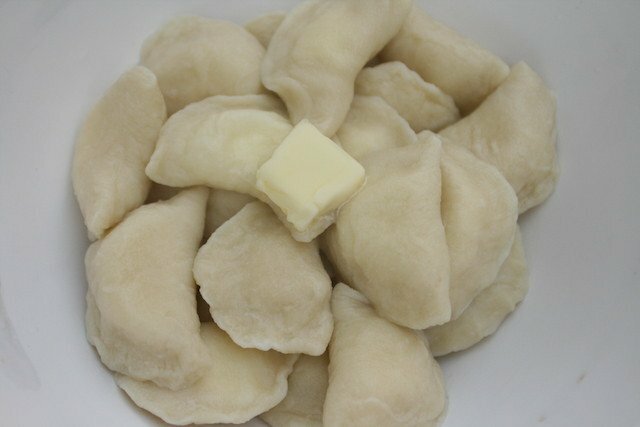 Pelmeni – Mostly filled with a meat mixture. 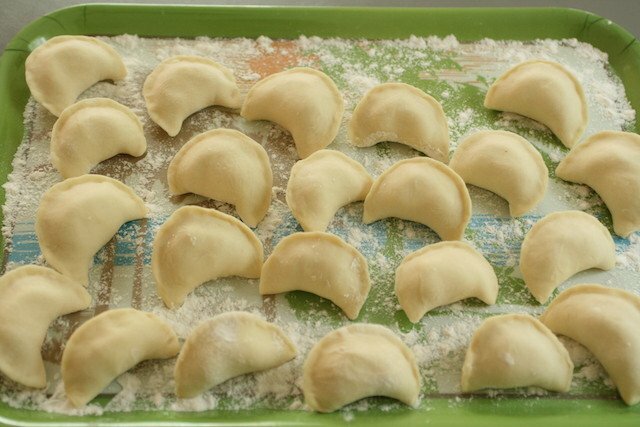 They are usually round and much smaller in shape than Vareniki. 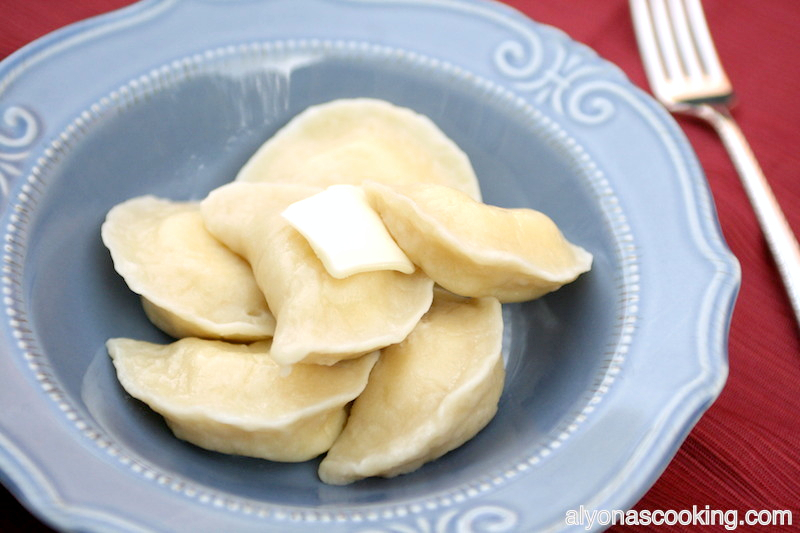 Pierogies– Well known for the mashed potato fillings and believed to be originated from Poland. 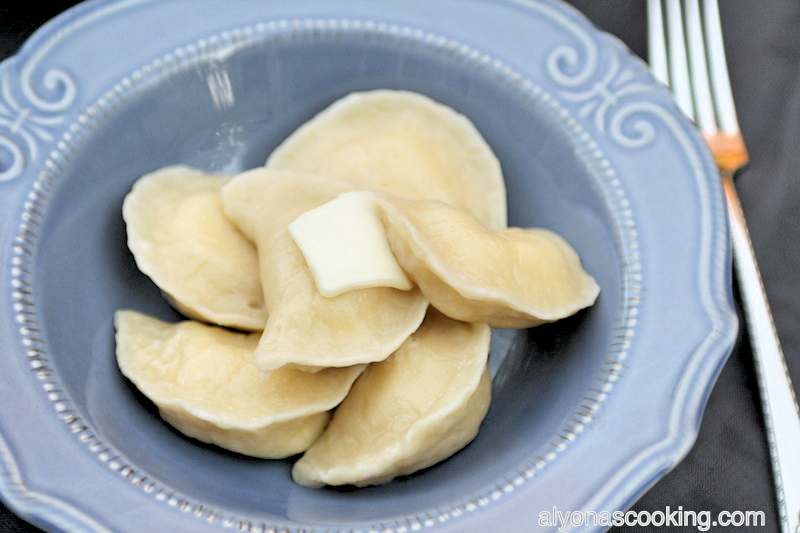 Very similar to vareniki, although the dough might have some slight differences in texture. The doughs may vary in texture as each dumpling recipe is different but the concept is very basic as commonly used ingredients for these dumplings consist of flour, eggs, milk, water or buttermilk. Depending on what ingredients you use each dumpling may be different in texture. 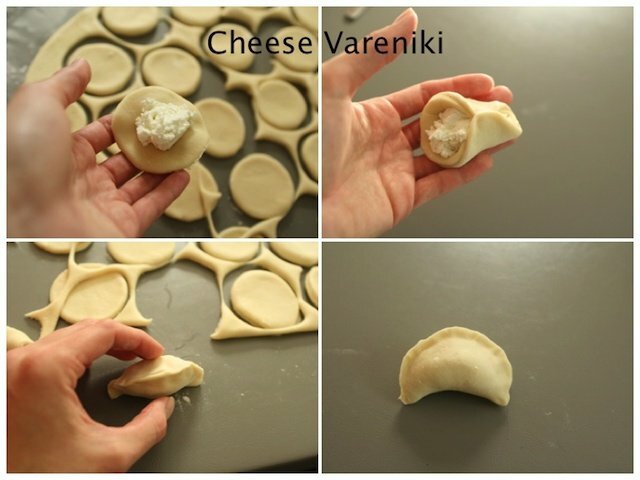 If you want more denser and slightly thinner vareniki use basic ingredients such as water and flour. And if you want to have fluffier vareniki use ingredients like buttermilk and rising agents such as baking soda for fluffier results. This recipe is for fluffy yet slightly dense vareniki. They are al dente to the bite and don’t fall apart, unless you were to over boil them. 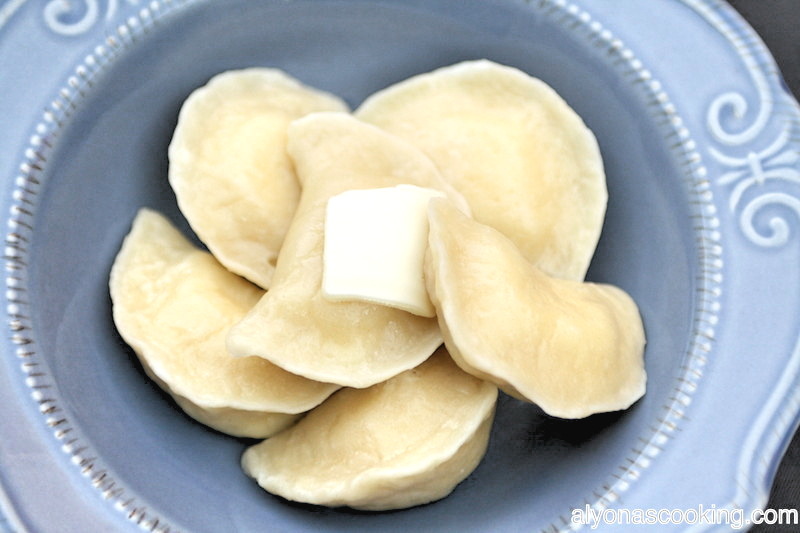 This classic recipe is from my mother who makes amazing vareniki. In this post I will be showing both mixer & bread machine methods. Although I didn’t seem to see a drastic difference between the two, I did notice air bubbles in the dough from the bread machine dough (meaning, it was much fluffier than the mixer dough). Both resulted in fabulous results. 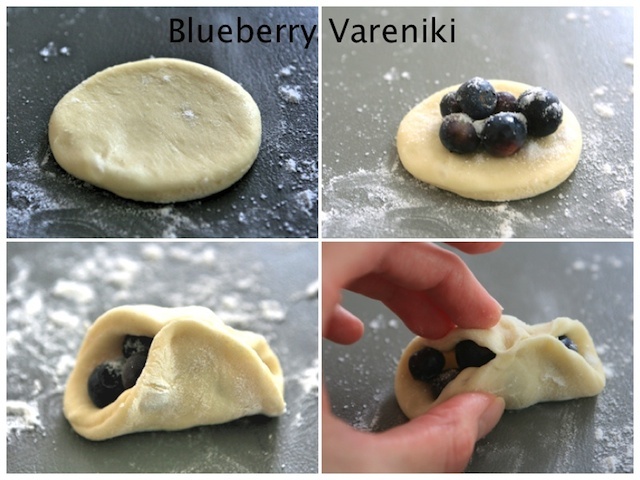 I filled my vareniki with a farmer’s cheese and blueberry filling. Serve with some sour cream and enjoy! If using a stand mixer: Whisk the dry ingredients and then add the wet ingredients; combine and knead dough for about 7-8 min adding more buttermilk if needed. Dough will be tacky yet firm. Cover and allow to sit 20 minutes. If using a bread machine: just combine all ingredients and set bread machine to dough settings. Bread machine settings will knead and allow the dough to slightly rise so you can start working with the dough as soon as you remove. NOTE: THIS RECIPE IS FOR 1 PORTION (about 40 vareniki) I made 2 DOUGHS TO DEMONSTRATE THE DIFFERENCES. 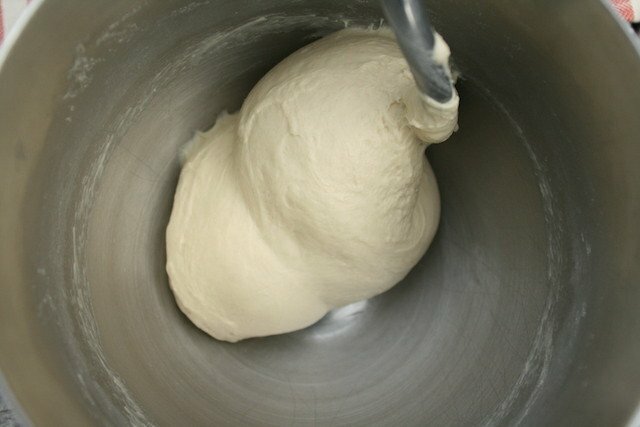 ONE PORTION MAKES 1 BALL OF DOUGH. The bread machine dough was slightly smoother and fluffier than the mixer dough. 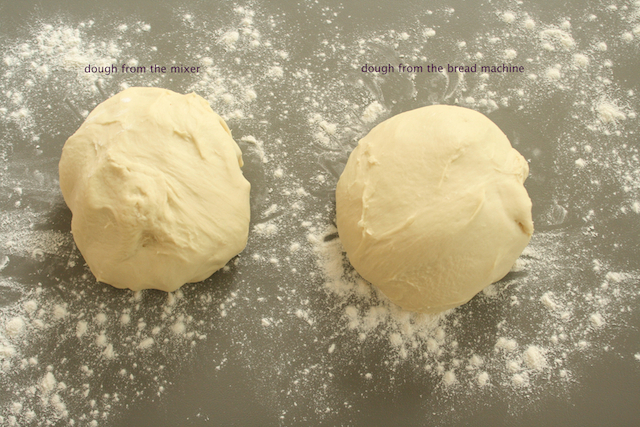 On a lightly floured surface roll out ball of dough into a rectangle about 20″ long by 14″ wide. 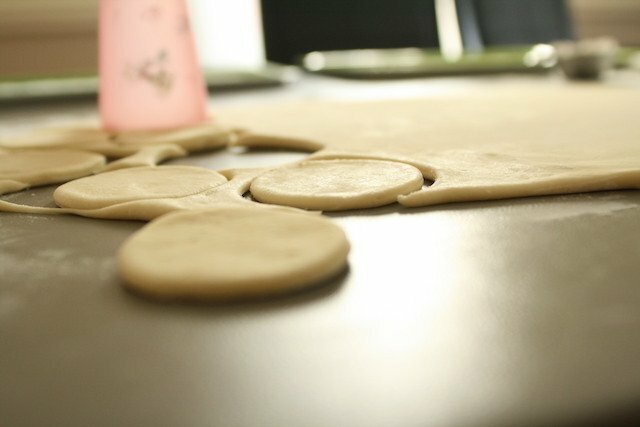 Using a biscuit cutter or cup (about 2 1/2″ in diameter) cut out circles from the rolled out dough. 3. 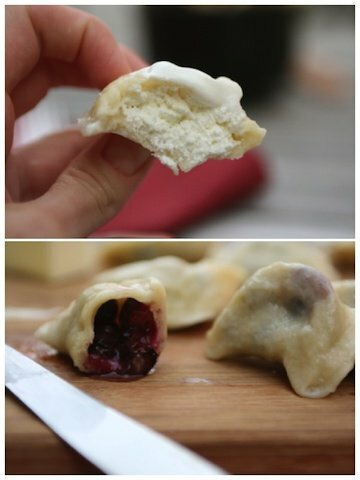 Fill each circle with a teaspoon of filling. Then pinch sides to seal vareniki and place onto a floured surface. 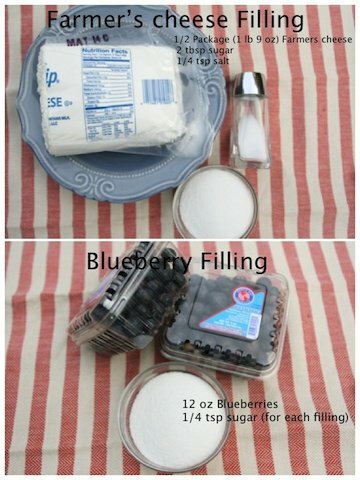 Blueberry Filling: sprinkle about 1/4 tsp of sugar over the blueberries. 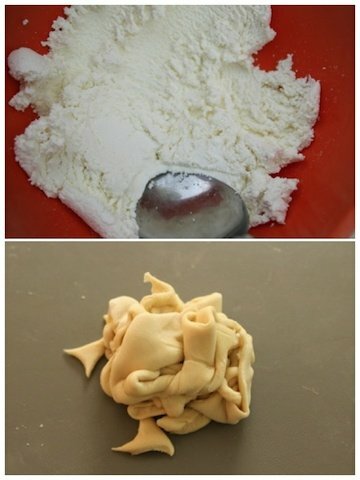 Cheese Filling: Combine all the ingredients together and rub with a spoon to soften the cheese mixture. 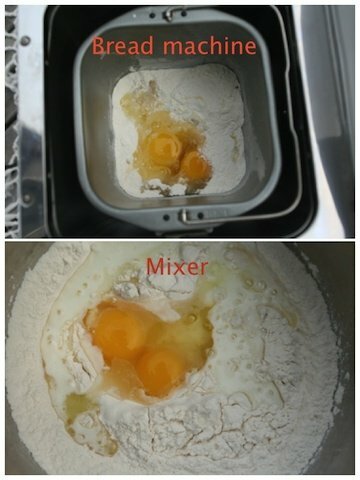 Add a heaping teaspoon into each circle. 4. Roll out the scraps to use up any left overs. 5. To cook vareniki; bring a large pot of water to a boil (about half way full.) Add vareniki and boil for 5 minutes from the time you throw them in. They should float up to the top. 6. 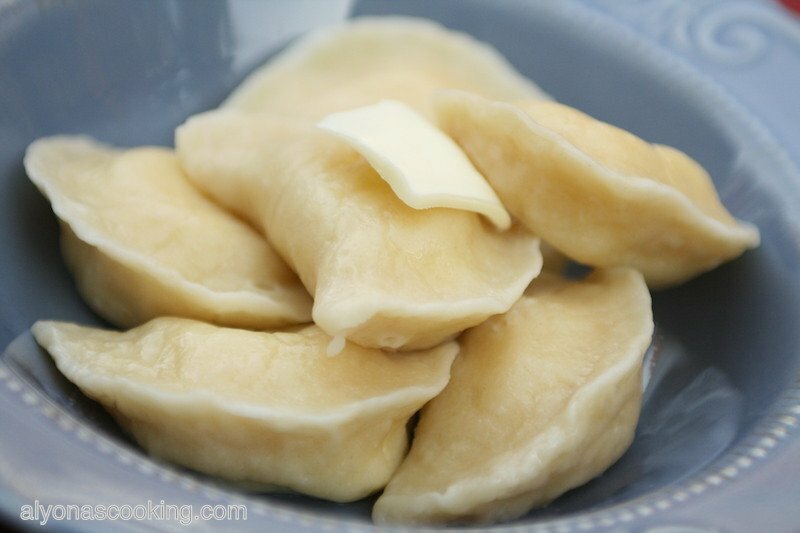 Toss cooked vareniki in some butter and serve with sour cream. On a lightly floured surface roll out ball of dough into a rectangle about 20" long by 14" wide. 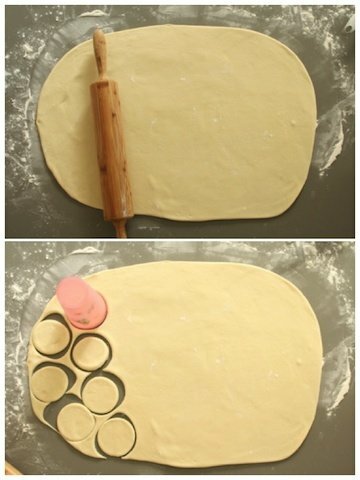 Using a biscuit cutter or cup (about 2 1/2" in diameter) cut out circles from the rolled out dough. 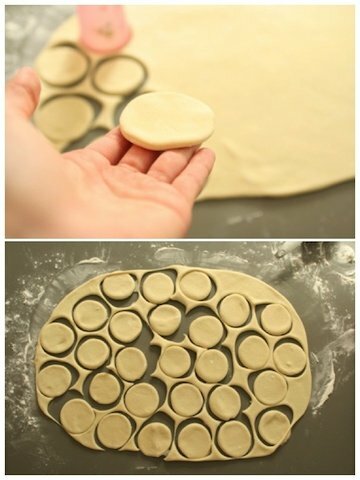 Fill each circle with a teaspoon of filling. If doing blueberry filling sprinkle about 1/4 tsp of sugar over the blueberries. If using cheese filling; Combine all the ingredients together and rub with a spoon to soften the cheese mixture. 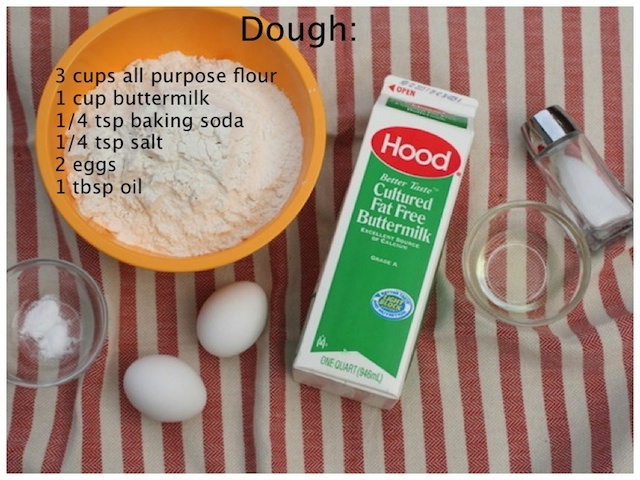 Add a heaping teaspoon into each circle. 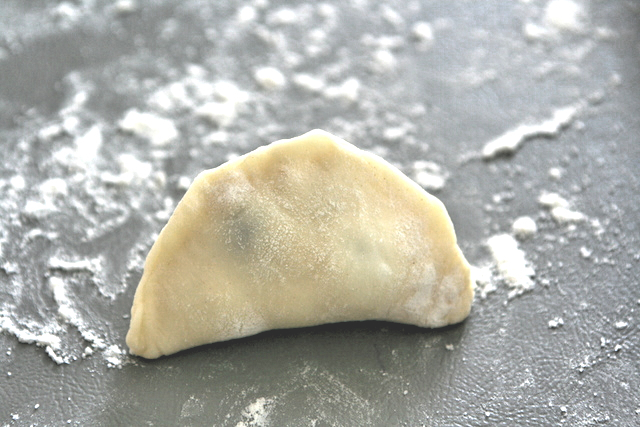 Pinch sides to seal vareniki and place onto a floured surface. Roll out the scraps to use up any left overs. 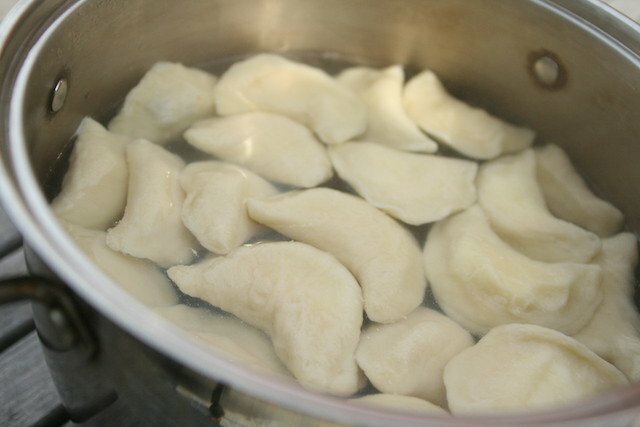 To cook vareniki; bring a large pot of water half way full to a boil. Add vareniki and boil for 5 minutes from the time you throw them in. They should float up to the top. TIP: You can freeze the vareniki after filling only avoid freezing any berry ones (the juice from the berries can leak out when thawed). If cooking frozen vareniki boil an additional 2 minutes.